This trip is either not currently scheduled, or it is not yet available for booking, and the information on this page may be incomplete or out of date. In Brief: Explore the Silk Road sights around Dunhuang, including the amazing Mogao Grottoes and Crescent Lake. 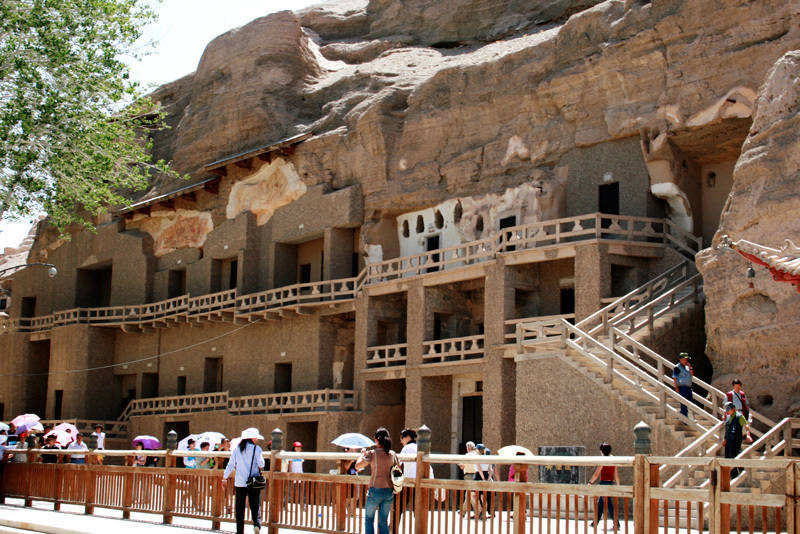 The exterior of the Mogao Caves. Explore the Silk Road sights around Dunhuang, including the amazing Mogao Grottoes and Crescent Lake. The trip includes some good hikes, including a day in the Dunhuang National Geopark, an area of dusty and windblown landscapes known locally as ‘The City of Ghosts’. Dunhuang was a key stop on the northern Silk Road, allowing travelers to stock up on food and water before heading on through the desert. 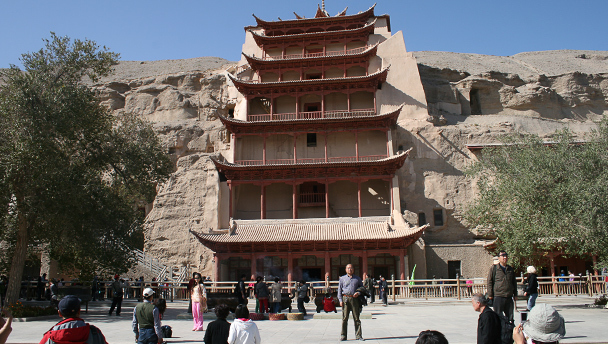 It’s said that a fort was built in Dunhuang around 100 B.C., and the area holds plenty of historical interest – in particular, the Mogao Grottoes, and Crescent Lake. 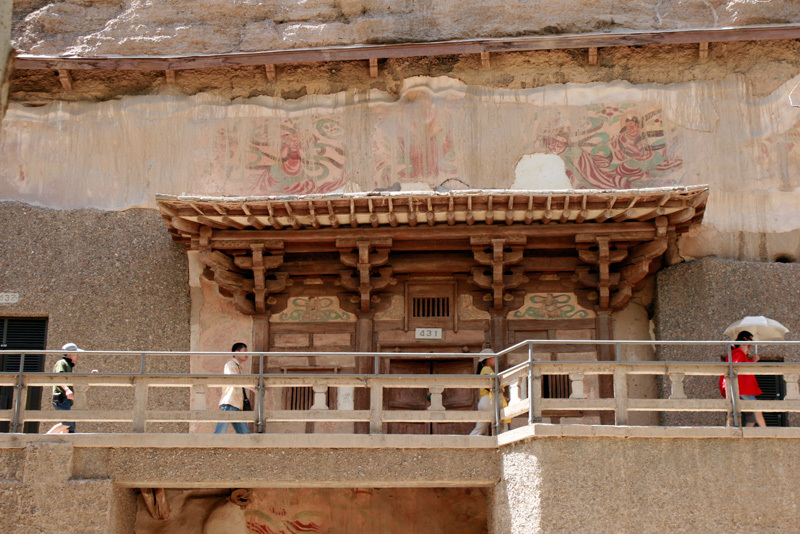 Fly to Dunhuang; visit the Mogao Grottoes. 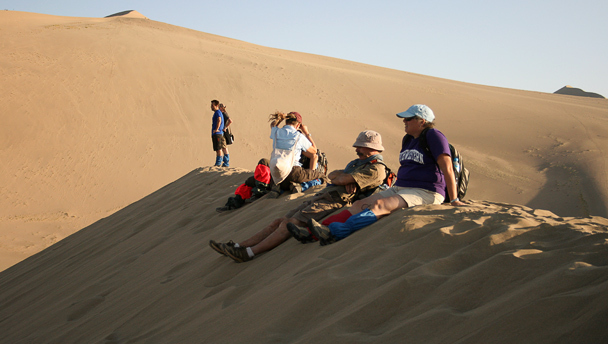 Hiking in the Dunhuang National Geopark. 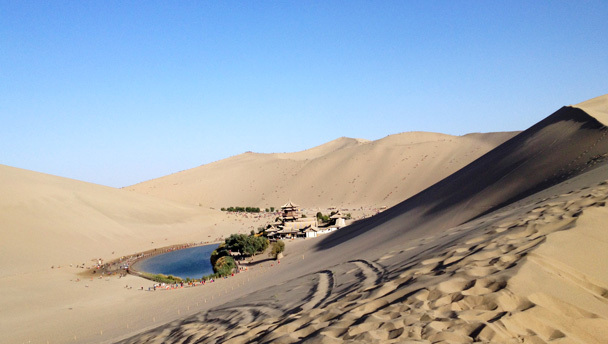 Hike through the desert to Crescent Lake and Mingsha Sand Dunes. 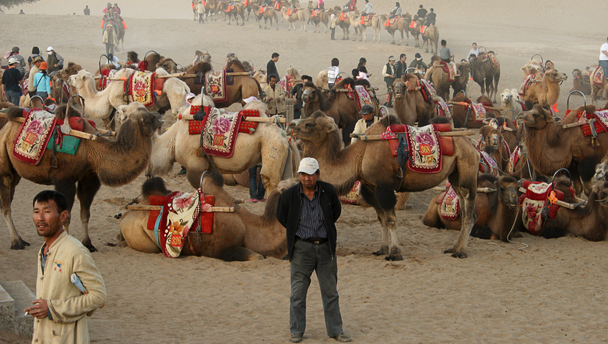 Visit Dunhuang’s old quarter, midday flight to Beijing. 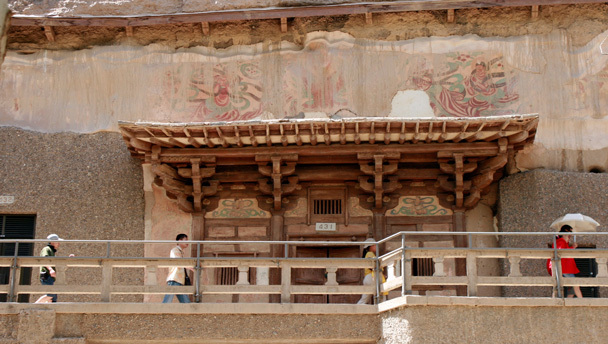 A UNESCO site since 1987, the Mogao Grottoes were dug out by Buddhist monks, starting around 366 AD. Initially, the caves were used as a place to meditate, but, over time, they began to fill up with scriptures and painted murals. Four-hundred and ninety-two caves still remain, containing statues and murals. We’ll visit around 10 of the caves to have a look at the frescoes and statues. The area is a little touristy, but well worth a look. Photography is forbidden inside the caves, but you can get a good look by bringing a torch. The Mogao Grottoes are one of the main highlights of the trip—consider the amount of work required in construction, and then the fact that they were preserved in mostly pristine condition by being buried by blowing sand, and forgotten about for nearly 400 years. The other two main sites of interest in Dunhuang are located in the same area. Crescent Lake is a crescent-shaped lake of clear water that has somehow managed to avoid being filled in by the shifting sands of the desert. 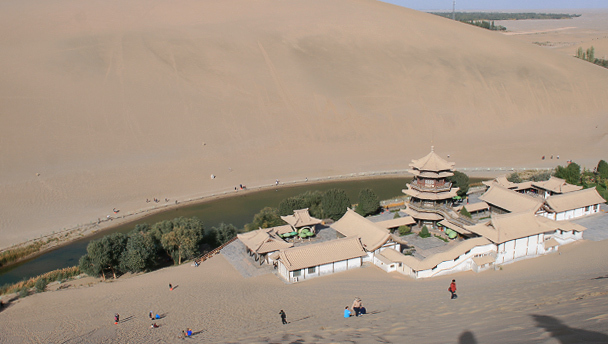 A temple is located next to it, as well as the Mingsha Sand Dunes. The dunes are known as the Echoing Sand Dunes because of the strange sounds made by wind – and feet! – over the sand. The dunes are around 250m in height, from top to bottom. After climbing up, it’s super-fun to run down! 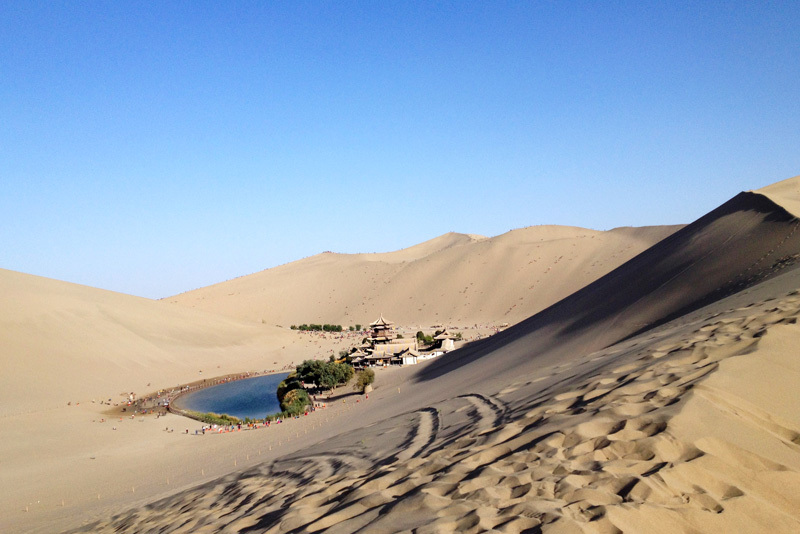 On this trip we'll be doing two good hikes: nearly a full day in the Dunhuang National Geopark, and then a hike through the desert dunes to reach Crescent Lake. 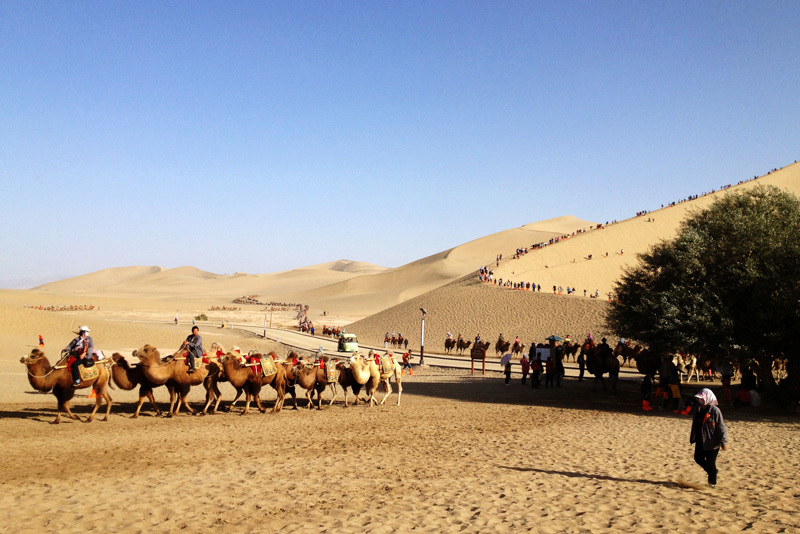 Hike in the Dunhuang National Geopark: details to be confirmed. Hike through the desert: On our scale it’s probably a Level 3+ hike, but hot weather will make it feel more difficult. There are some big sand dunes to climb up, and with the sand it’s 2 steps up, 1 step back. We’ll walk through a small village just before we get to the big dunes. 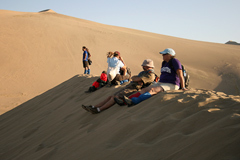 Hiking over gives us some quiet time in the dunes before we run into all the tourists – and camels! – at the popular Crescent Lake. In August, the temperature averages around 31°C during the day, but can get up as high as 40°C in extreme circumstances. Night time temperatures average around 15°C. Rain is unlikely at this time of year. We will be staying in a 4-star hotel in Dunhuang. You’ll be sharing a room at the hotel with another hiker. If you'd like a room to yourself for the whole trip, it can be arranged at an extra cost of 1,000 RMB, if a room is available—usually not a problem! Further details about room shares and single supplement can be found in the documents we send you as part of the registration. We fly to and from Dunhuang for this trip. Transportation between the various scenic locations will be by private bus. Frequent flyers: Please let us know if you would like to use your frequent flyer miles or if you are a frequent flyer member. If you would like to organise your own flights, we can provide further details. We will take most of our meals at restaurants in the areas we visit, or at the hotels or guesthouse. On one of the days we include a picnic lunch for you. Bring some spending money for snacks during the trip. Please let us know if you have any special dietary requirements or food allergies. Contact us at any time for more information. Payment terms, conditions, and details will be supplied along with a waiver document and travel guidelines after your registration request has been received. We usually need to get 8–10 people signed up to go ahead with this trip. Beijing Hikers reserves the right to decide who may participate in this trip.